I used to plug in my phone overnight on the nightstand beside my bed. First of all, when my phone, which serves as my alarm clock, would sound early in the morning, it was too easy to quickly turn it off and go back to sleep. Charging my phone by my dresser on the other side of the room hasn’t entirely eliminated that problem, but it has made it more of a nuisance to get up and turn it off. But there was a bigger problem. With my phone beside my bed, it was not unusual for me to just check a few things just before I went to sleep. And in the morning, when I was awake but too lazy to get out of bed, I could just reach over, and with one eye open, check my email, my Facebook or news feed. Worse yet, when on occasion I lay sleepless in the night, I could occupy my sleepless mind by staring at the world of information to be found on my phone. In the past six months or so I have been spending a great deal of time in the Psalms. And I began to realize that my phone was functioning in the way that the Psalmist speaks of the Scriptures. Oops. Evening and morning I turned to my phone. Let the morning bring me news from the latest source. On my bed I remember my Facebook friends. No, that’s not how it’s supposed to go. What if, instead of opening my eyes to see what my friends have posted, I did what generations upon generations of believers have done when they arose from slumber? What if my day was more punctuated by prayer than by my regular urge to check my phone? What if I did what Christians for centuries have done and prayed the daily offices of prayer that were basically a structure for prayer using the psalms? 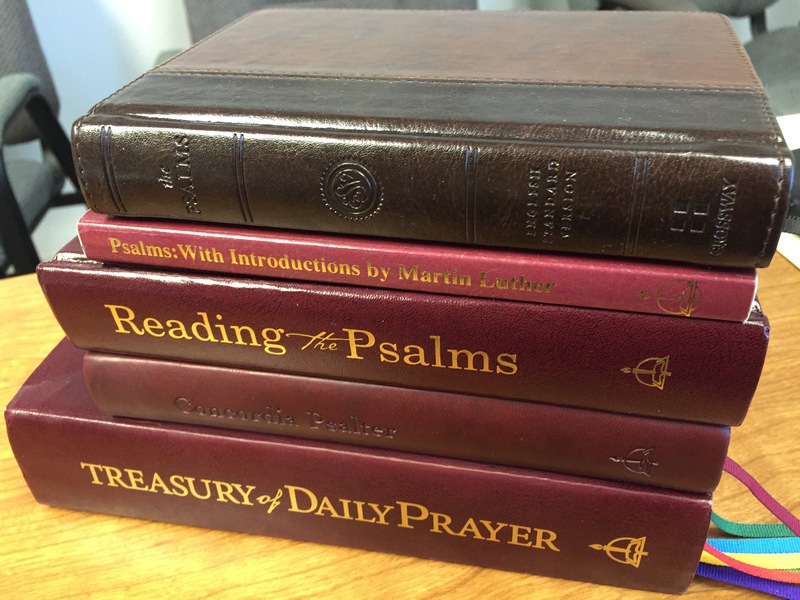 It was our congregation’s transition to the ESV that prompted my venture into the Psalter. My lips have been praying the Psalms in NIV for many years, and this was the best place to start to re-memorize. I love this little volume—the size, format, page layout. The only thing I wish this had was marks for chanting. Right now I’m just writing them in as I need. This is basically the Psalm text with some introductions to the Psalms written by Martin Luther. Ironically, Luther asked that people not print them interspersed with the Psalter as they did here. The older version is NIV and not pointed for singing. The newer version (Reading the Psalms with Luther) is pointed for singing and also includes psalm prayers for each psalm. This one was just published at the beginning of this year. It also has a nice size, it is marked for chanting with simple psalm tones for each psalm and psalm prayers. It is essentially a revision of the above volume, but with the psalm tones in place of Luther’s introductions. The cover is beautiful and feels great to hold in the hand. This is a much larger volume, for a complete daily prayer solution. But in the back of the book is the entire psalter, marked for singing. Additionally, the content from this volume is also available in the iOS and Android app PrayNow. One great little feature of that is that when you pull up the psalm (also marked for singing) it displays your psalm tones and will even play the tone so that you can hear it before you sing. This is great for travelling. In many of these volumes there is some guidance on reading the psalms. I usually don’t advise people to attempt to read the Bible straight through. But that doesn’t hurt to do with the Psalms. Remember that the Psalms were collected and arranged in the order they are in. They are intended to be read in order. Still, perhaps you wish to follow a schedule. And there is good reason to read certain psalms at particular times of the day, or at specified times of the year. I wouldn’t just read the psalms you are already most familiar with, or just pick them at random. Here are a couple schedules you won’t find in the above books. Through the Psalter in 60 days. There is a similar chart like this in TLH and the Evangelical Lutheran Hymnary for reading the psalms in 30 days. I have found that 60 days is a more reasonable pace. The other advantage is that this schedule assigns the evening and morning psalms to the appropriate times of day. Seasonal Schedule. This one appoints four psalms for every day—two in the morning and two in the evening. During most seasons of the year this weekly schedule repeats. This one is nice to become really familiar with certain psalms during parts of the year. I first saw this schedule in the little book The Minister’s Prayer Book and more recently it was included in the Lutheran Service Book hymnal.